We grow some spicy cress in the beds with our spring mix greens. We will start harvesting this week. This is one of the fastest greens to grow at 15 days. 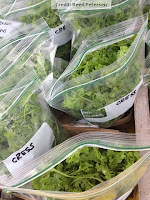 Cress has a peppery flavor and is used in salads and for soups and sandwiches. We sell it separately so you can use it mixed with greens or separate. It can also be used as a medicinal herb to prevent postnatal complications, indigestion and constipation. Feel free to comment anywhere if you would like us to do a certain topic (ex. How To's, Information, FAQ's, etc.) or if there are certain aspects of our blog that you particularly enjoy and want more of.